Lucknow, a city famous for its deep-rooted history has been an important hub of heritage and culture in the country. Whether it was the rule of the kings or the era of the Nawabs, it was during their reign that art, music, literature and textiles reached their glorious peaks. The rulers of Awadh were huge patrons of everything that spelled art and culture, and fostered the local crafts, taking them to new heights of elegance and finesse. The foremost examples of which are the art of Lakhnavi Chikankari and Zardozi, that have gained popularity all over the world. We have a very rich lineage in fashion and textiles that takes many intricate forms, and to promote them, royal families got together in Lucknow not long ago. As a city that likes to stay connected to its roots, Lucknow often witnesses events that remind us of the splendour of our regal past. 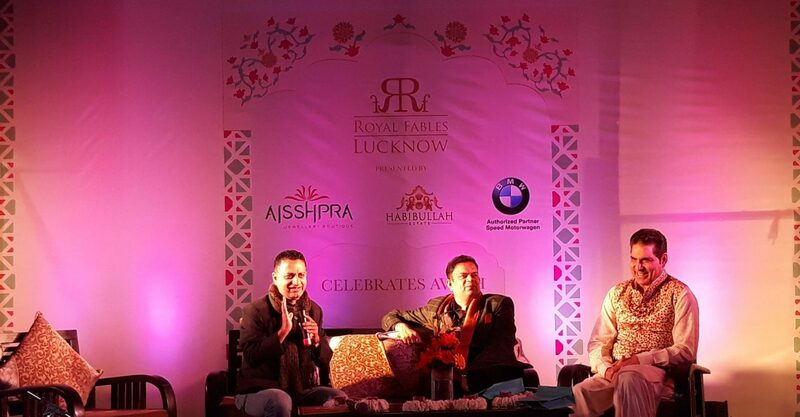 One such event concluded recently in the city was an impressive exposition by Royal Fables – a platform where royal families and the leading designers come together to keep this heritage alive in the modern times. The grand exhibition was held for the first time in Lucknow at the Habibullah Estate in Hazratganj. It was inaugurated on 1st march in the presence of Dr. Rita Bahuguna Joshi who was the chief guest of the evening, and the guest of honour, Rani Sandhya Kumari of Khajurgaon. The day began with a formal lunch and curated walk, followed by a book launch and a panel discussion on ‘The rich Lakhnavi embellishment trail of the Nawabs’, with Madhu Jain, Rajkumari Alka Rani Singh of Pratapgarh, Rajkumari Veena Singh of Padhrauna, and Asma Hussain as the guests. The panel was moderated by Manuu Mansheet. Held between 1st – 3rd March, the rare showcase included a spectacular collection of heritage-inspired art, fashion and textile articles crafted in some of the most prominent palace studios of the country. In an effort to keep the traditions of hand-made creations alive, designs of this extravagant legacy were tastefully recreated to match the sensibilities of the present-day lifestyle. The patrons of this unique platform are the leading designers and artists who belong to some of the foremost royal families of the country.